This is the best method that I have found for ensuring that my students not only truly understand, but also adequately practice Noble Gas Configuration. 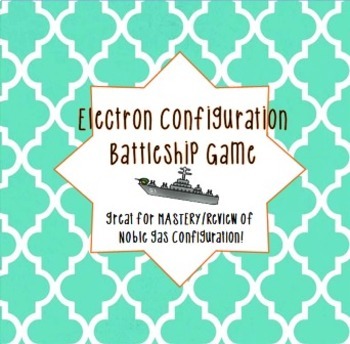 This game can be played as a review at the end of a unit, or just after taking notes on noble gas and electron configuration. 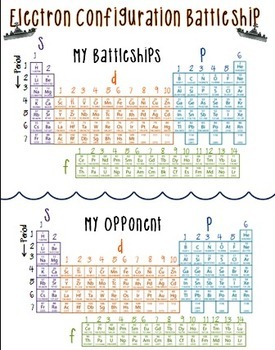 Here’s how it works: students guess the noble gas configuration for different elements to try and to sink their opponents ships- once they sink a ship they have to write out the electron configuration. It gets them practicing configurations in a fun way! This game has been student tested many times and always receives great reviews. When students are struggling it helps you clearly pick them out. I normally walk around the classroom and help students get started that don’t understand. Once they get the hang of this activity they quickly master the activity! 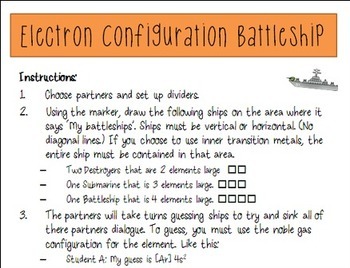 The file includes a cover page, teacher recommendations from my personal experience, student instructions, page for student work, and four different options for battleship boards.